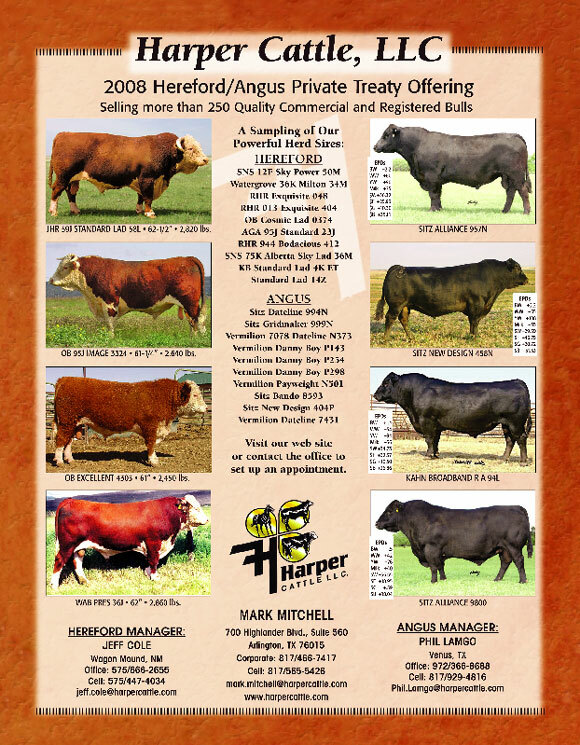 This year, we have over 100 head of Hereford bulls and over 100 head of Angus bulls for the offering. At Harper Cattle, our goal is to provide the commercial cattleman with the seedstock needed to produce cattle that adapt to their environment, rustle for the feed, are fertile, calve with ease, have copious milk and are a good mother and raise a superior calf. Harper’s rock solid genetics enable your cattle to thrive in good times and bad with reasonable oversight and care, but, no pampering or special care. The Texas Ranch, our Angus Ranch, is located just south of the Dallas-Fort Worth Metroplex in Venus, Texas. The New Mexico Ranch, our Hereford Ranch, is located in Wagon Mound, New Mexico. The 2008 Private Treaty Offering will include over 100 Hereford bulls plus a good sampling of Angus bulls for the Angus buyer in New Mexico and likewise over 100 Angus bulls plus a good sampling of Hereford bulls in Texas. Please contact our Texas office at 817.466.7417 or our New Mexico office at 575.666.2655 with any questions about our operation and the 2008 Private Treaty Offering or let us know if we can help you in any way. We want to be your seedstock provider.